Get a head start on your New Year’s resolution and get the book that could change the way you feel and look. 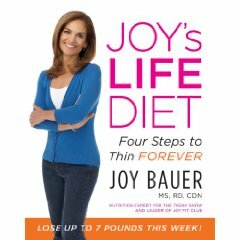 Celebrity nutritionist and author Joy Bauer, MS, RD, CDN, has an exciting new book, Joy’s LIFE Diet: Four Steps to Thin Forever . You might know Joy from her wonderful and informative segments on the Today show as their resident nutritionist. She has inspired thousands of people to learn more about weight loss and how nutrition can improve your life, through her many books like Food Cures and 90/10 Weight Loss Plan, as well as counseling people through her private practice at Joy Bauer Nutrition. Joy’s LIFE Diet will help you to shed those “holiday” pounds, and people who have participated in the diet already have lost up to 7 pounds in the first week! Joy’s ” L.I.F.E.” Diet stands for Look Incredible, Feel Extraordinary so get ready to reap the other benefits of doing the diet – you’ll have more energy and enjoy a more exciting and active life.